Yesterday was one of those individual days of summer that we are getting this year. Bookended by cool and grey. I took advantage of the sunshine after a trip to Liverpool, and a stop at the tackle shop to pick up a pint of maggots, for a walk along a length of canal I haven't fished since it was dredged and work done on the towpath. Everything was regenerating nicely. Even the alders that had been cut back were a couple of feet high now. There was a bloke fishing to some far bank reed growth, and while chatting to him a six inch pikelet glided under his pole without a wag of its tail as if being pushed along by the canal's tow. It was propelled by tiny fin movements, though, as it cut across towards the reeds. Everywhere the surface was alive with small fish, from tiny pin fry up to eel-bait size. It had to be worth returning in the evening if the weather held. As the stock of frozen roach was getting low, and the lobworms had turned to a stinky mush in their tub, I arrived in good time so I could put the float rod to use. With all those small fish about bait snatching would be a cinch. The Archers had just started as I cast out but the closing theme tune had long faded away by the time I got my first bite. They weren't coming thick and fast, but steadily enough to put a few fresh roach in the bag. They were all ideally sized, except for one that would have made a better pike bait. I wasn't greedy and returned a few after I had got enough to last the session on past performances. I carried on with the float until nine o'clock when it got a bit cooler as the sun began to sink. It was a glorious slow sunset, the light constantly changing. I tried to make something of it with the camera until the sun was below the horizon. As I'd arrived a flock of swallows and martins were mobbing an unconcerned kestrel heading out over the moss. While I was float fishing there were more swallows showing off their low flying skills over a freshly mown meadow where rabbits grazed and occasionally chased each other in circles. As dusk arrived a barn owl flew behind me totally unconcerned by my presence, returning half an hour later on the same flight path. This felt like a small victory. I hastily rebaited and recast this time I set the bobbin on a drop, and did the same with the right hand bobbin. The next half hour is a bit of a blur. I know I had another run on the right hand rod which I missed. I know this because just as I had rebaited and cast out the left hand rod was away. This was a good run and again I connected with the eel. 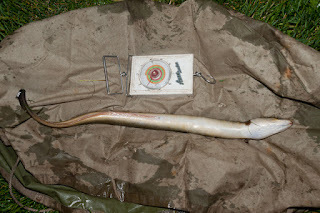 The difference being that this eel got to see the inside of my landing net! The fish unhooked itself in the net, partially. 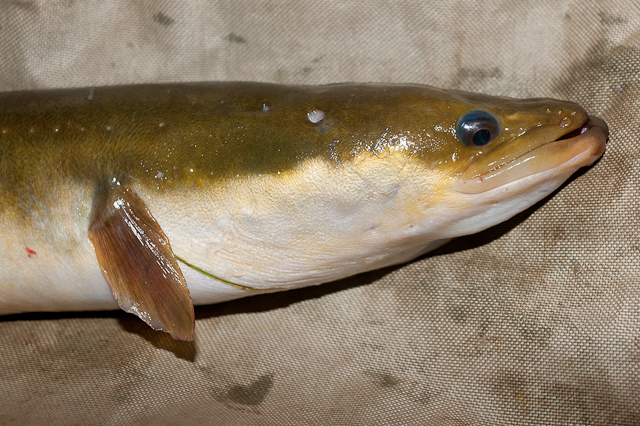 The hook had been transferred to the mesh but the trace was threaded through the eel's bottom lip. Because I am using Proleader, which can be knotted, the trace was attached to a quick release swivel by a loop. It was easy to unclip the trace and pull it through. Then I untangled the hook and weighed the eel. Only a couple of ounces bigger than the first of the season it was a tiny step in the right direction. I did the laying it on its back and stroking it's belly trick ready for a photo. While I was doing this the right hand rod was away again. In my haste I missed that one. Another rebait and recast saw my stock of fresh deads diminishing rapidly. I had been going to call it a night after returning the eel, but with action still forthcoming I gave the left hand rod the Three Rs treatment - retackle, rebait and recast. 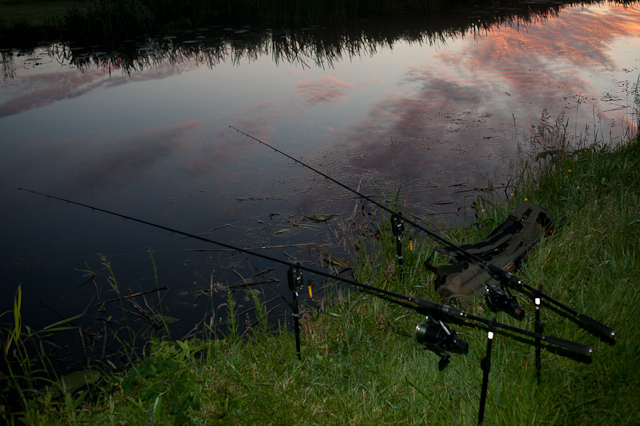 The bait was taken almost immediately by a fish which was felt for a second or three before it escaped. I'm not sure how many runs I had but after half an hour it was as if the switch that had been thrown had been flicked back again. I gave it another fifteen minutes then packed up and set off for home, driving through patches of low lying 'Hound of the Baskervilles' mist along the low-lying road. Whether it was coincidence that I fared better this time, maybe the eels were feeding more confidently, or whether the bobbin on a drop was the key, I'm not sure. I do have a feeling that it helped. It's given me something to consider, and an incentive to have another bash if the weather is conducive. The weather is more for my benefit as I'm sure the eels aren't put off by a drop of rain.